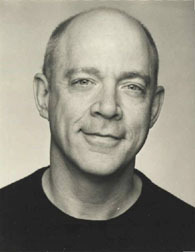 J. K. Simmons was born in Michigan, but his family moved to Ohio in his youth, and to Montana when he was 17. He majored in music at the University of Montana, and thought he was going to be a singer. When it became clear that wasn't going to happen, he tried out as an actor at the Bigfork Summer Playhouse in Bigfork, Montana, in 1977. Simmons appeared on stage in many local and regional musicals, comedies, dramas, and Shakespeare plays before moving to New York in 1983. He first appeared on Broadway in 1990, and his biggest Broadway hits came as Benny Southstreet in a long-running revival of Guys and Dolls, and as Captain Hook opposite Cathy Rigby's Peter Pan. On television, he has played Vern Schillinger, the neo-Nazi leader in Oz, and Dr. Emil Skoda, the sardonic, cynical criminal psychologist on Law & Order and assorted spin-offs. During commercial breaks, Simmons provides the voice of the yellow M&M candy. In movies, he played J. Jonah Jameson, the cigar-chomping newspaperman in the Spider-Man movies, and sang in the cartoon feature Anastasia. Simmons was also in The Ref, The First Wives Club, The Jackal, The Cider House Rules, Hidalgo, and The Ladykillers, and Above Freezing, a low-budget comedy about a florist who gets stuck in a walk-in refrigerator with Simmons and a stash of marijuana.